Gift Cards are available for purchase directly at the box office of the Esquire, Mariemont and Kenwood Theatres, or online at Amazon, Ebay and giftcardmall.com. They are also available at brick and mortar Kroger and Meijers' in the Cincinnati area. A minimum denomination of $10.00 is required for each gift card. Gift Cards are valid at all three locations. 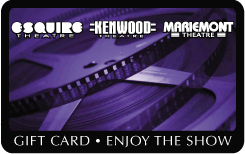 Receive 4 free movie passes by purchasing $150 or more in gift cards in one transaction at the Esquire, Mariemont or Kenwood Theatre Box Office (This offer is not valid for online or Kroger and Meijer purchases).